Mitsubishi has given its SUV range a styling makeover and pointed to a new future with the introduction of the new Mitsubishi Eclipse Cross SUV. 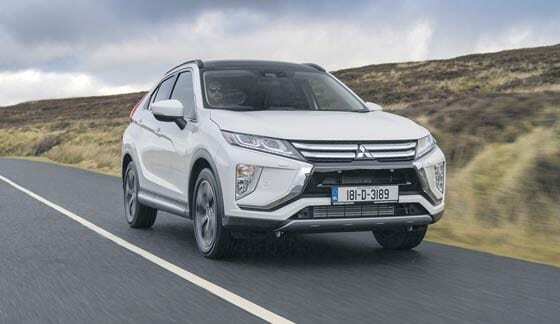 In a packed mid-range SUV market, the new Mitsubishi Eclipse Cross stands out as a stylish smooth operator as Michael Moroney found out during his recent test drive. Mitsubishi Motors aims to build on its SUV reputation by adding a new and more styled Eclipse Cross compact SUV to its range. This new design is a departure from the utilitarian look of the current Mitsubishi SUV range, giving the Japanese brand, which is now firmly a part of the Nissan Renault Alliance, a stronger product opportunity. 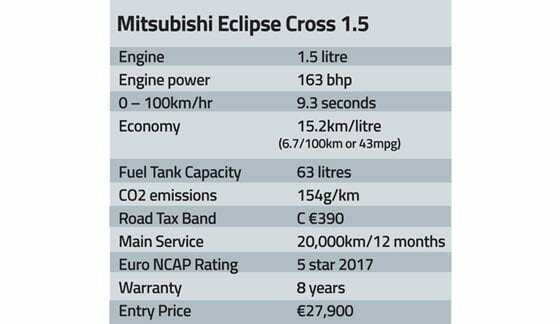 While this new Eclipse Cross is seen as slotting in between the current Mitsubishi ASX and Outlander models, it’s clearly very different. The Eclipse Cross styling is so strong that it puts the others somewhat in the shade as Mitsubishi’s bright new SUV for the future. For Mitsubishi this new Eclipse Cross brings a fresh new opportunity to the market. For Irish SUV drivers, this latest offering scores high in the style stakes, in a segment of the car market that’s in danger of getting over-subscribed. The car incorporates some new petrol engine technology that delivers impressive smoothness and performance. Mitsubishi Motors in Ireland have kept it simple. At this stage there is one engine choice, a new and lively 1.5 litre capacity turbo-petrol engine. Later this will be joined by a new 2.2 litre turbo-diesel version, but for the present Mitsubishi is confident that petrol power has a significant place in the SUV market. I’ve had the Mitsubishi Eclipse Cross across a 1,145km test route that included a wide range of typical Irish mixed driving conditions, some good and some dreadful. The lasting impression is of a smooth performer with good driving pace and reasonable economy. The outstanding appeal factors included the engine which I rated highly for its ease of driving and good low rev torque. 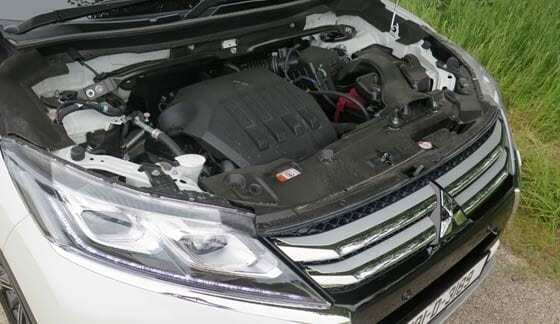 Most petrol engines require higher revs for longer drives to combine performance with acceleration ability. For the Eclipse, the low rev torque impressed me so much that I could cruise on motorways at 120km/hr while just marginally exceeding the 2000rpm rating on the rev counter. Combine this with an eight speed CVT automatic gearbox and the engine smoothness was further complimented to give an overall pleasant driving experience irrespective of the road conditions. On motorways it was at its best, giving good acceleration, and most of all a quiet smoothness. This means that longer drives are very pleasurable and never tiring. With that engine flexibility, I had expected a slightly better fuel economy figure and closer to the Mitsubishi rated figure of 15.2km/litre (6.7/100km or 43mpg). My driving performance delivered a range of 760km from the full 65 litre fuel tank, which meant that I was 30% off this rated figure. Despite that, this economy level didn’t feel too thirsty, while relative to similar diesel powered SUV’s the margin of difference is still significant. Creeping higher petrol costs at the pump will mean that without steady conscious driving, fuel costs could be a more significant part of the ownership costs of the Eclipse. The internal layout of the Eclipse is a further part of the SUV’s appeal. 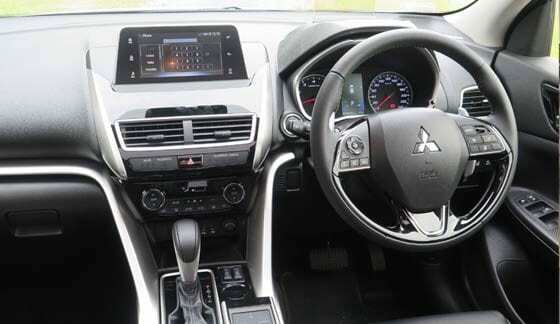 The dash layout is more modern than that of others in the Mitsubishi range with a familiar feel to some parts. There’s a large central screen with a multi-function system that includes a novel touchpad controller beside the gear lever that can operate audio functions like radio and iPod, as well as the Apple CarPlay and Android Auto. Many of the functions can also be controlled by the multi-function steering wheel. Mitsubishi claims that this new touchpad interface allows for a more intuitive operation than the usual rotating knobs. For instance, audio volume can be adjusted using two fingers to swipe the controller screen either up or down. This took a little practice to perfect, while it’s a skill quickly perfected by those of us who live with smartphones and tablets. The standard kit for what is called the Invite version includes a reversing camera, Bluetooth and USB connectivity and rear seat passengers benefit from sliding rear seats (200mm) with an 8 step recline. The safety features include a forward collision mitigation system, lane departure warning system, LED daytime running lights and 7 airbags. The Eclipse comes with a Euro NCAP five-star safety rating that’s right up to date. While the top-of-the range Intense version, which I drove comes with a whole lot more including larger wheels, a 9 speaker premium radio system, leather seats, electric heated front seats, Rockford Fosgate audio system, panoramic glass sunroof, multi-around monitor for easier reversing, blind spot warning (BSW), lane change assist (LCA), rear cross traffic alert (RCTA) and adaptive cruise control. Entry prices are competitive at €27,900 for what is a substantial SUV. 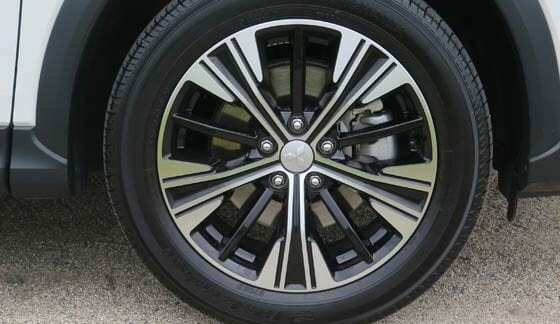 The bigger alloy wheel option will make a huge difference to the stance of the Mitsubishi Eclipse Cross, so most buyers will opt for the second grade up Intense version with this smooth CVT gearbox, which will add another €4,500 to the price and changing its competitive position ever so slightly. The Eclipse marks a change in styling at Mitsubishi. The three-diamond quality image remains firmly intact with this new model, so this is an SUV that should look well and perform well for many years to come. The engine and CVT gearbox are stand-out impressive; the overall driving experience is pleasant and untiring. There are 182 value deals on offer including low cost finance, and the 8 year warranty is a further attraction.